Magpies that live at airports are less likely to flee from aircraft noise than those that live elsewhere, according to our research. But it is unclear whether this makes them more likely to be involved in a collision. Magpies that are more blasé about aircraft noise are likely to come into closer proximity with passing planes. But conversely, they might also be less likely to attempt a risky escape flight that would actually increase the danger of a collision. Every day, throughout the world, flying animals (birds and, to a much lesser extent, bats) collide with aircraft. Many such collisions are minor and often go unnoticed. But they can be scary and damaging. In the worst cases, aircraft have lost power and crashed, causing catastrophic damage and loss of life. Most bird-aircraft collisions occur at low altitudes, where birds and planes share common airspace. At these altitudes, pilots have limited options for aircraft recovery. Moreover, the smaller the aircraft and the fewer the engines, the greater the chance of substantial damage should a strike occur. Pilots are trained in how to avoid and handle bird strikes, as famously featured in the movie Sully, which portrayed US Airways pilot Chesley Sullenberger's successful manoeuvre to ditch in New York's Hudson River after striking migrating geese shortly after take-off. Aircraft engineers tackle this problem by designing engines that can more easily withstand bird strike. Airport managers try to make airports and their surrounding areas less attractive places for birds. Part of this includes "hazing" – harassing birds to scare them away from flight paths and runways. Scientists, for our part, have been addressing the problem by monitoring birds' behaviour at airports, the effectiveness of hazing, and the types of birds that are most commonly struck by aircraft. By identifying problematic species and situations, we can help airports and airlines manage the hazard as effectively as possible. Our new research focused on the Australian magpie. This species is ubiquitous, familiar, relatively large and frequently struck by aircraft. The Australian Transport Safety Authority reported 513 magpie strikes betwen 2006 and 2015 (5.9% of a total of 8,717 strikes). This puts magpies in the top ten most struck bird species. Birds, like most other animals, respond to potential danger in their environment. Throughout their evolution, such responses have been the difference between surviving or becoming prey. A wealth of studies have shown that birds show "escalating responses" to the presence of danger in their environment. First they become vigilant, including by listening. Then, if the perceived risk continues to grow, they fly away or find some other means of escape. These behaviours are broadly the same regardless of whether the danger comes in the form of a predator, a human, a car or a plane. But an aircraft on takeoff is much faster than almost all prowling predators – in this case, danger is approaching at hundreds of kilometres per hour. It is crucial to understand how and when aircraft trigger birds' escape behaviours. In some cases, escape behaviour could even increase the risk of a collision, rather than reduce it. Many birds typically turn and fly in the same direction as the aircraft is moving, in a bid to fly "away" from the approaching danger. Many killed birds show injuries to their back and side – head-on collisions are relatively rare. Anyone who has befriended a magpie knows that they are intelligent animals that can alter their propensity for escape based on experience. Some even actively visit"magpie-friendly" gardens for food, having thus almost entirely suppressed their escape responses in those locations. It is likely that a magpie's first warning of an approaching aircraft comes via sound, rather than sight. 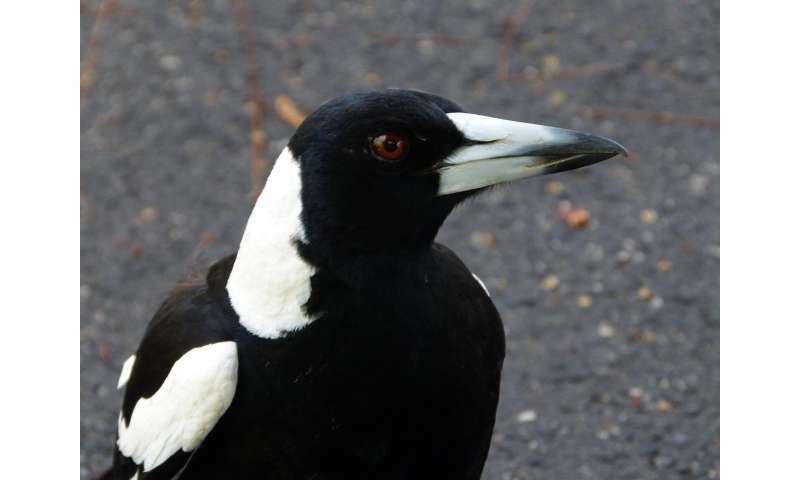 So my colleagues and I, together with investigators from Avisure, a consultancy that develops and implements bird hazard management at several Australian airports, examined magpies' responses to recordings of light aircraft noise. We looked at wild-living magpies at the RAAF base at Point Cook, Victoria, as well as those living further away from the air base. We found that playbacks of take-off soundtracks produced more magpie responses, and more intense responses, than did landing soundtracks. Responses were least likely and were delayed among magpies living at the air base, compared with those that live further away. This suggests that magpies adjust their behaviour when they are routinely exposed to aircraft. While it remains unknown whether this adjustment influences strike risk, it does raise a crucial question: should we seek to retain or remove birds at airports that have apparently got used to living alongside aircraft? Their reduced responsiveness might mean that they routinely come close to aircraft, but it might also mean they are less inclined to undertake risky escape flights. Removing experienced birds might mean that other, more naïve birds move in to take their place, potentially increasing the bird strike risk still further. This question, and many others, remains open. But one thing is clear from the research so far: birds are not just passive objects getting in the way – they make complex, nuanced decisions in the face of aircraft collision risk, and our approach should reflect this fact.